Pleeple is an informative and entertaining internet delivered system that displays social media entertainment to venues at low cost. 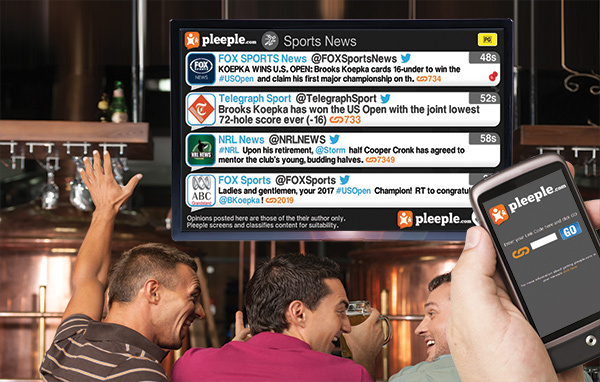 Pleeple pushes social media messages from twitter and other short form social media sources to a display screen in real time making for a very current and relevant form of entertainment that people find hard to look away from. Due to each message being self contained it's entertaining whether you're queueing for a coffee for 5 minutes or you're sitting for hours. It's perfect for cafes, restaurants, bars, food courts, shopping centres, retail stores or just about anywhere people congregate. All content displayed is filtered through our advance content filtering system to make it safe for public consumption. The system also features a rating system so that you can decide what level is suitable for your customers. Channels can be configured to include "sticky" content from certain sources. For example a food chain may include a celebrity channel for the enjoyment of patrons, but from time to time might broadcast special offers as social media which can be set to stay on-screen for a defined time. This achieves several beneficial outcomes, the messages are in-channel and as such get far better traction as patrons do distinguish them from the entertainment, the chain is seen as understanding the patron better and as a contemporary business plugged-in to what they like. When Pleeple displays social media that links to web content such as youtube, images, news articles or blogs it displays a simple 4 digit code in the content that the patron can jump on their smart phone or any internet ready device and go to the Pleeple.com website to jump instantly to the content referenced. A patron in a coffee shop for instance sees a financial news story from Bloomberg come up on a Pleeple channel, a 4 digit link code is included 1234, simply entering 1234 on the base page of Pleeple.com immediately takes the viewer to the Bloomberg website where the full story in hosted. All that's required is a modern display e.g. LCD, LED, Plasma, a small hardware device called a terminator, and an internet connection. Wired or wireless. Pleeple utilises a simple fanless piece of hardware called a terminator. This same hardware has been reliably driving digital signage solutions for an established network for many years. These units have extremely low power requirements requiring around the equivalent of 1/10th of the current of an average light bulb to run and producing almost no heat. Call 1800 676 705 today.